An in depth look at how the early Jewish-Christians would have viewed the Mysteries of the Rosary, along with an unveiling of the prophecies and signs in the Scriptures pointing to the coming of Christ. The Shroud is a linen cloth with a herringbone weave of a type that was in use among the Essenes during the 1st century. It measures exactly 2 cubits (.91 meter) (3 ft 7 in) by 8 cubits (3.66 meters) (14 ft, 3 inches). Such cloths were used as a burial cloth. The Shroud contains a negative image of a man crucified according to Roman custom but who was separately scourged over his entire body and was crowned with thorns. The man is just under 6 ft. (1.8 m) tall, very tall in an age where the average man was under 5’ 6” (1.68 m). The man weighed about 185 lbs. (84 kg). The man has long hair pulled back into a pony tail and a long beard. The long hair and beard could denote a Nasserite as it was the custom of Israelites under a Nasserite vow to neither cut their hair nor trim their beard. The individual on the Shroud has been identified as of Semitic origin. 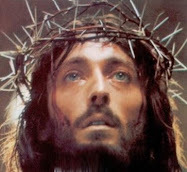 He has been crucified according to Roman custom; however, he has also worn a crown of thorns and has endured a separate scourging over his entire body below his neck. A full body scourging is usually fatal. There are no other documented cases where an individual has endured both a full body scourging, a crucifixion, as well as a crowning with thorns (The signature of Jesus the Nazarene). He has also experienced a stab wound on the right side between the 5th and 6th rib that occurred after death. It is important to note that the image on the Shroud itself is a mirror image. 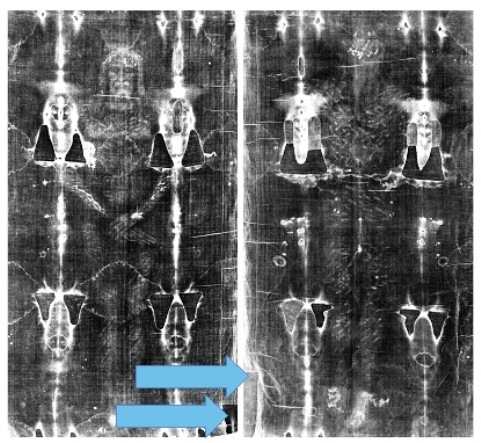 The picture shown in this document (following the Sorrowful Mysteries) is a negative of the negative image on the Shroud. That makes it a positive image allowing all the wounds to be visible. The image you see is as if walking up to Jesus and looking at him as He lay in the tomb. The shroud is the most studied historical artifact in the world. The image is a negative. The negative image shows the blood on the forehead forming an epsilon while the original image shows the same blood stain as the letter E: the mirror image what appeared on Jesus’ forehead. The shroud itself has suffered burns and water damage over the years and has been repaired and restored multiple times. 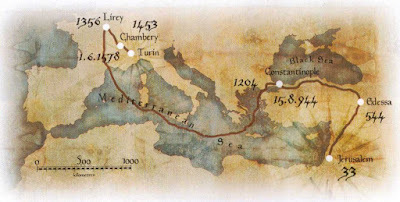 There are a variety of versions of the early history of the shroud prior to 1349. 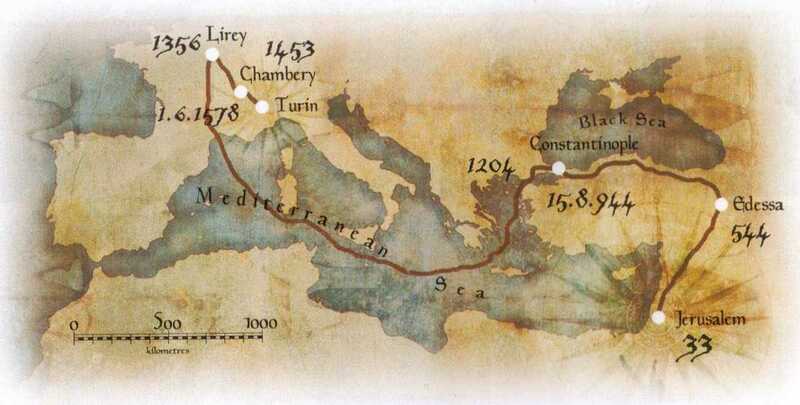 The most plausible begins with King Akbar of Edessa writing a letter to Jesus asking him to come to Edessa. The king had leprosy and had been told that Jesus could cure leprosy. He sent the letter by his fastest runner with the added request that if Jesus could not come would the runner at least draw a picture of Jesus so that he could see what He looked like. The runner arrived on the day we call Palm Sunday and Jesus was occupied. After Pentecost the Apostles decided that they would send the Apostle Thaddeus also known as Jude to the king in Edessa. 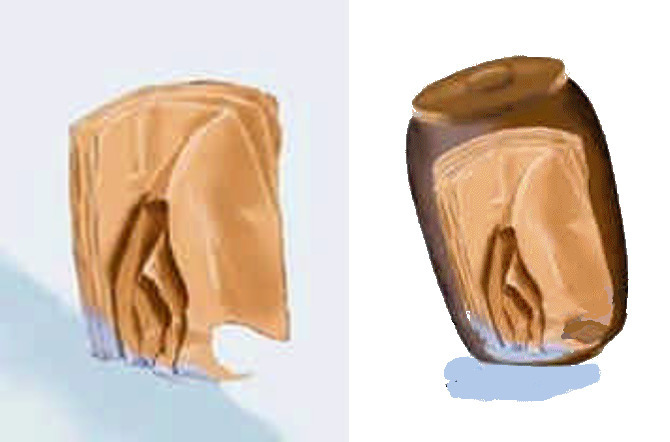 In response to the king’s request for a picture Jude would take the shroud, folded to show just the original facial image as shown in the figure above. King Akbar was cured of his leprosy and became Christian along with the whole “city state”. Edessa was in fact the earliest center of Christianity, while Akbar lived. When Akbar died his son reverted to paganism and the priests folded the shroud and hid it in an earthen ware jar in a secret room in the city wall. The room was then sealed. The shroud remained in the wall for 400 years because the new king killed those who hid the shroud for not disclosing its location so that he could destroy it. There was severe flooding in Edessa in 544 and much damage was done to the city wall. After the flooding subsided repairs began on the wall. While masons were scraping the damaged mortar off the wall some fell into the wall instead of off the wall. An examination was made and several earthenware jars were discovered. One of the jars contained the shroud. Christianity was by this time flourishing again in Edessa. The priests knew that the shroud had been hidden somewhere in centuries past. They were delighted to be in possession of it again. It was incorporated into the liturgy. Word began to spread and from that point forward pictures of Jesus show him with a beard. Sometime later the emperor in Constantinople decided that a small city like Edessa should not have such a valuable relic. It should be in a large important city like Constantinople. Thus in 944 he sent an army to besiege Edessa until the people in Edessa agreed with him: which they eventually did after they got hungry enough. A special display mechanism was made for the shroud that would allow the shroud to be raised up to show the face of Christ at an appropriate time during special liturgies. When the 4th crusade started one of the crusaders wrote a letter home that described seeing the shroud during a liturgy. As we know the crusaders got trounced in Jerusalem and on their way home in 1204 they decided to take their frustrations out on Constantinople and thereby liberate numerous relics and riches. After the sacking, the Patriarch of Constantinople wrote to the pope asking for his relics back, especially the shroud. The pope asked the leaders of the crusade what had happened to the shroud and was told that it had not been seen. It was believed that Otto de la Roche had the shroud and he bequeathed it to the Knights Templar. Then in 1357 Geofrroi de Charny mysteriously procured the shroud. It is known that Thaddeus aka Jude went to Edessa. There is pollen from both Edessa and Constantinople on the shroud. The letter from the crusader describing the shroud in Constantinople is real. The letter from the Patriarch of Constantinople to the pope is real. There is water damage on the shroud from the storage in the earthenware jar. The strip was very professionally sewn back onto the shroud with a stitch that has only been used by Essenes from Masada (37 BC) until the end of the 1st century ,  . It is on the shroud and runs the full length of the linen just 4 inches (102 mm) from the edge. The tradition is that Mary the Mother of Jesus sewed the strip back onto the shroud and would have done it before her nephew Thaddeus took the shroud to Edessa shortly after Pentecost. From the time of the Apostles the shroud was folded to allow the face to be the only visible image on the shroud. This is thought to be in deference to sensibilities in that it is a burial cloth. To center the face on the cloth, each side was folded back about 9 inches (228 mm) from the edge. This left the shroud about 25 inches (635 mm) wide. The shroud was then folded in half at the middle and then folded repeatedly from the top and bottom until only the face remained. Having so folded the cloth the outside edges where the cloth was repeatedly handled caused the markings to be rubbed away. The markings on the shroud are very similar to a scorch in that they are on the very surface of the fabric. Thus, the image can be rubbed off with too much handling. There is in the National Library of Budapest a manuscript referred to as the “Pray Codex” named for Jesuit priest György Pray, who discovered it in 1770. 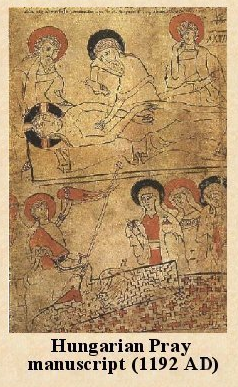 It is the oldest example of Hungarian literature in existence and was produced circa 1192-1195 CE. The Pray Codex is not a great work of art. However, it is an important marker in the history of the Shroud for it establishes the existence of the Shroud years before the earliest date allowed by the controversial 1988 carbon dating. The Chambery Fire in 1532 occurred when the candles during a funeral melted the silver lining on a casket and the molten silver fell onto the lid of the reliquary holding the shroud. The lid caught fire and part of it fell into the reliquary. The red areas indicating the extent of the water damage from putting out the fire. There is swelling to his right cheek, just below the eye. There is also swelling in the shape of a half moon just above the mouth on the right side. The bridge of the nose is very swollen and the navel septum has deviated away from the central line. One nostril has become wider than the other. The beard has been pulled out at the center of the chin and below the right side of his mouth. (Is 50:6). The scourging was done by two men each using a flagellum. The lead balls were designed to bruise and at the same time to tear the skin. 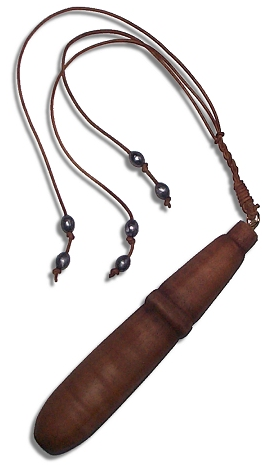 The leather strips were each a different length so that the lead balls could not land on each other: each would strike the body. While Jewish law restricted the number of blows in a scourging to 39 (Deut 25:3), Roman law had no such restriction. The objective of the soldiers was to mark his entire body below his head. Looking at Jesus on the Shroud we can see that they succeeded. 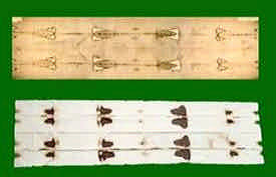 A member of the team that studied the shroud in 1978 counted the markings: 135 lashes. 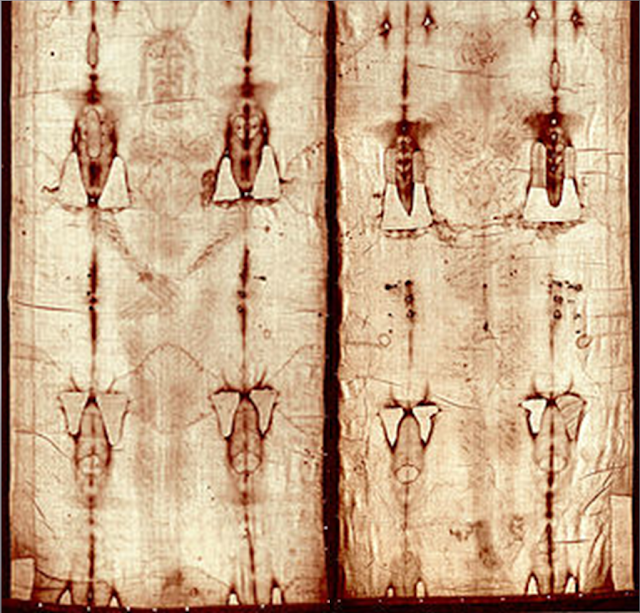 The shroud image as shown in this document is in black and white, it is yellow and brown on the original. But consider the purple bruising on his body that resulted from each of the strokes of the flagellum! With each stroke, 6 lead balls traveling in excess of a hundred miles (161 Kilometers) an hour strike his body! Anywhere, below his neck, that was not bleeding was bruised. The scourging would cause penetration of the skin (bleeding) with trauma to the nerves, muscles, and skin; reducing the victim to an exhausted condition with shivering, severe sweating, frequent seizures, and a craving for water. Those who died from scourging died from traumatic shock that was accelerated by blows of the lead balls to the chest. Traumatic shock causes the rupture of the alveoli in the lungs. Direct blows to the chest physically damages the alveoli thereby accelerating the progress of traumatic shock. 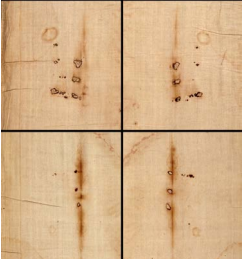 If you compare the ventral and dorsal images of the Shroud, you should notice that there were fewer blows to the chest. That was required to keep Jesus alive as requested by Pilate. The soldiers formed a crude crown (actually more like a cap) from thorns and placed it on Jesus’ head. The thorns were of the Zizyphus Spina species and were approximately one inch (25 mm) in length. Head wounds bleed profusely. The wounds from the crown of thorns were still leaking blood after Jesus died 8 hours later. That would indicate that the thorns were continually being pushed into the nerves as He turned his head or leaned back while on the cross. While Dr. Frederick T. Zugibe, M.D., Ph.D was studying the shroud, he had a patient come in after accidently having a large needle driven though her hand. He was amazed that not only did it exit exactly where the exit wound was on the shroud; it also entered exactly where Padre Pio and St Francis of Assisi had the entry wounds on their hands. When x-rayed it showed that no bones were broken and as nails would easily have held the weight of the body on the cross. Jesus was nailed to the cross though his hands and feet. 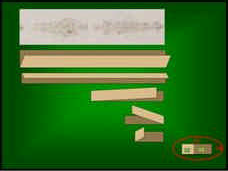 The nail was driven into his hands at an angle so that it entered low on his palm and exited on the back of his wrist. (The same way you would put a nail in the wall to hold a heavy picture.) 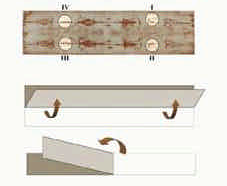 A nail driven as shown above into the “Z” area of the hand will separate the small bones in the hand without breaking them (Nm 9:12)  and a nail driven at that angle would have prevented tearing since it exits at the back of the wrist as shown on the shroud. The large square iron nails driven through each hand into the cross, as shown above, will damage the sensory branches of the median nerve resulting in one of the most exquisite pains ever experienced: known medically as causalgia. A single nail was driven through both of his feet, with his left leg slightly bent so that his left foot was on top of his right. The hours on the cross, with pressure of the weight of the body on the nails through the hands and feet would cause episodes of excruciating agony every time Jesus moved. These episodes, the unrelenting pains of the chest wall from the scourging, and the excruciating headaches exacerbated every time the back of his head touched the cross driving the thorns into the occipital nerve would greatly worsen the state of traumatic shock. The first repair done on the shroud was sewing the side strip back onto the shroud. It was done sometime in the 1st century by an Essene seamstress. Since the shroud was taken to Edessa after Pentecost it may have been done right after the resurrection. Sometime around 1300 the frayed ends on the strip that had been removed to bind the body into the shroud were repaired. The handiwork was so well done it was not detected until chemical analysis revealed the foreign threads. A modern day restoration was done in 2002 to the consternation of scientist afraid of contamination to the historical fabric. The individual whose image is on the shroud was found to be a Sephardic Jew. The blood type of the individual wrapped in the shroud is AB+. DNA testing was not possible as blood frequently does not contain a complete set of DNA and the shroud has had too many people handling it over nearly 2000 years. That is, there is too much contamination to know whose DNA was found. 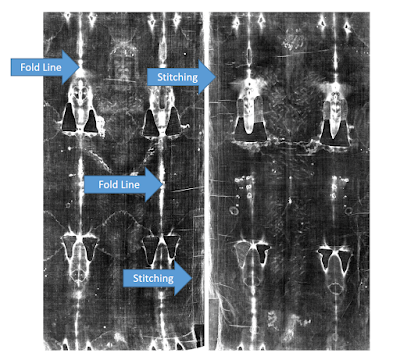 Initial results published in 1983 showed the shroud to date to the early 1300s. It was shown to be flawed in 2002 when chemical analysis showed the samples used for carbon dating were contaminated by foreign fibers. The chemical tests showed that there were foreign fibers in the sample area from a re-weaving that was done in early 1300s. Image of the Shroud in which the imprint of the front and back of a human figure is visible. The yellow arrow on the right indicates the region from which the fiber object of the study published on PlosOne was extracted. 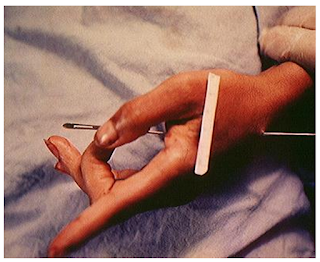 Forensic testing showed that the cause of death was traumatic shock (torture). It was also determined that the individual on the shroud suffered Roman crucifixion, and was crowned with thorns of the Zizyphus Spina species. The individual was scourged 135 times with a roman flagellum. It also showed 148 points of identity between the sudarium and the shroud. The pollen testing searched for pollen on the linen from plants which are indigenous to an area no more than 100 miles (160 km) in diameter. The only such pollens identified were from areas in and around: Jerusalem, Edessa, Constantinople, Southern France, and Italy. The textile analysis showed that the stitch used in sewing the side strip back onto the shroud was only used by the Essenes from the time of Masada until the end of the 1st century. It also identified the Herringbone weave used to weave the shroud. No pigments, paints, dyes or stains have been found on the fibrils. X-ray, fluorescence and microchemistry on the fibrils preclude the possibility of paint being used as a method for creating the image. Ultra Violet and infrared evaluation confirm these studies. Computer image enhancement and analysis by a device known as a VP-8 image analyzer show that the image has unique, three-dimensional information encoded in it. Microchemical evaluation has indicated no evidence of any spices, oils, or any biochemicals known to be produced by the body in life or in death. It is clear that there has been a direct contact of the Shroud with a body, which explains certain features such as scourge marks, as well as the blood. However, while this type of contact might explain some of the features of the torso, it is totally incapable of explaining the image of the face with the high resolution that has been amply demonstrated by photography. The basic problem from a scientific point of view is that some explanations which might be tenable from a chemical point of view, are precluded by physics. Contrariwise, certain physical explanations which may be attractive are completely precluded by the chemistry. For an adequate explanation for the image of the Shroud, one must have an explanation which is scientifically sound, from a physical, chemical, biological and medical viewpoint. At the present, this type of solution does not appear to be obtainable by the best efforts of the members of the Shroud Team. Furthermore, experiments in physics and chemistry with old linen have failed to reproduce adequately the phenomenon presented by the Shroud of Turin. The scientific consensus is that the image was produced by something which resulted in oxidation, dehydration and conjugation of the polysaccharide structure of the microfibrils of the linen itself. Such changes can be duplicated in the laboratory by certain chemical and physical processes. A similar type of change in linen can be obtained by sulfuric acid or heat. However, there are no chemical or physical methods known which can account for the totality of the image, nor can any combination of physical, chemical, biological or medical circumstances explain the image adequately. Thus, the answer to the question of how the image was produced or what produced the image remains, now, as it has in the past, a mystery. The Shroud has been shown to be an ancient textile. The carbon dating which had thought to show it was from 1300s has been shown to be faulted by contaminated samples. The image formation is not that of an artist as there is an absence of paint and the only successful attempt to reproduce the markings came from very high frequency radiant energy. The image is a negative and the concept of reversing light and dark while drawing a mirror image was unheard of until the invention of photography. The peculiar structure, size and distribution of the nanoparticles of creatinine bound to ferrihydrite particles cannot be artifacts made over the centuries on the fabric of the Shroud. The pathology of the wounds is consistent with the wounds of crucifixion and shows the signature wounds of Jesus the Nazarene. The wounds on the hands and side are counter to the traditional depiction of the wound of Christ. The forensic match points between the Sudarium and the shroud. The pollen grains show the shroud has been exposed to the open air only in the locales identified with the history of the shroud. There are multiple historical references to the shroud. The reference to the shroud with its unique burn marks in the Pray manuscript. 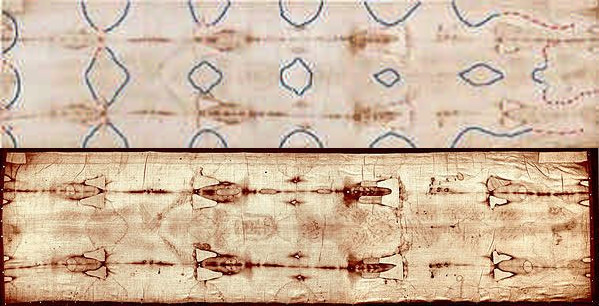 In 2012 a physicist named Baldakki determined how the image may have been formed on the shroud. 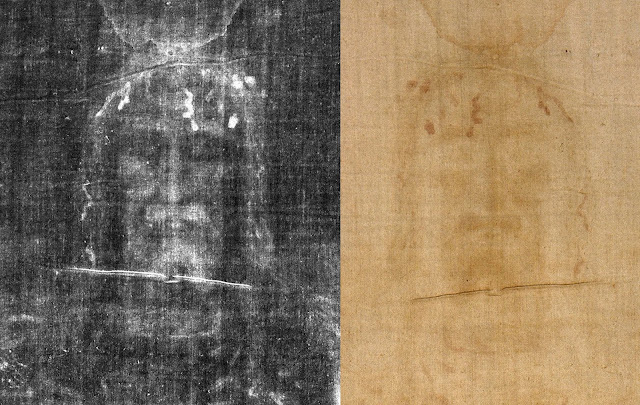 Comparative test on linen have shown that the image on the shroud will be formed by a 10 nanosecond burst of 193 nanometer radiation using 16MW/cm2/pulse with a 9Hz repetition rate. Such radiant energy produces the markings on linen that match the markings on the Shroud. That means that at the moment of resurrection there was within 10 billionths of a second, 9 pulses of radiant energy, (each of 16 million Watts), [enough power to provide electricity to 12000 homes] simultaneously radiated from every cm2 on his body as his body vacated the shroud and left it lying as it was positioned in the tomb. The choice of wave length, duration, and power used to test the linen was not arbitrary: it is the wave length, duration, and power that are produced when matter and anti-matter collide. Jesus’ resurrected body could pass through walls and locked doors. That total displacement of matter and subsequent reconstruction at a different location is also an effect of antimatter annihilation. In his resurrected body Jesus could and did relocate at will. This explanation is not accepted by all scientist as the action of antimatter annihilation is still theoretical. The crack of a whip is the end of the whip breaking the sound barrier at 600mph. A baseball pitcher throws at about 90-100mph. A BB gun pellet travels at 150 ft / second, (45.7 m /second), (100 miles per hour), (160 km per hour). 135 lashes * 6 BB’s per lash= 810: Equivalent to being shot 810 times with a BB gun in addition to 135 lashes with a whip. In Jn 19:31-37 John makes the point of telling us that “not a bone shall be broken” to fulfill the prophecy in PS 34:20. The flow of blood and pleural fluid on the shroud shows that Jesus was not on the cross. In addition the lance could not have pierced his heart if He was still on the cross. 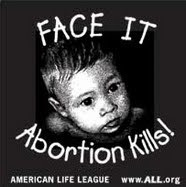 If the Sacred Heart of Jesus was pierced it happened in his mother’s arms!